Nokia has launched the Lumia 800 and Lumia 710, Windows Phones in India. 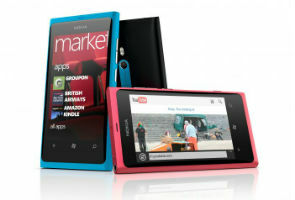 Nokia is positioning the Lumia 800 as its Windows Phone flagship and the Lumia 710 as the budget Windows Phone offering. The Lumia 800 features a premium polycarbonate uni-body design, a 1.4 GHz Qualcomm Snapdragon processor, 512 MB of RAM, a Clear Black AMOLED display with a WVGA resolution of 800x480 and an 8 megapixel camera with Carl Zeiss optics. The phone also features 16GB of internal storage as well as a unique curved glass display. As the budget option, Lumia 710 drops the premium construction of the Lumia 800 and features a basic plastic construction. Besides this, it has a cheaper WVGA LCD display and a 5 megapixel camera. The internals of the Lumia 710 are very similar to the Lumia 800 with both phones carrying a 1.4 GHz processor. Besides all these hardware specs, Nokia has added its services to the Windows Phone software, which include Nokia Drive, Nokia Maps and Nokia Music. These services are exclusive to Nokia Windows Phone devices and are the fruition of Nokia's partnership with Microsoft. No official India price was announced but expect the Lumia 800 to cost Rs. 32,000 and the Lumia 710 about Rs. 20,000 (based on international prices). The phones will be made available mid December. Nokia will also redesign 5000 outlets in India, a first of its kind activity for the Indian market. With the launch of the Windows Phones, there will be 750 India centric apps available in the marketplace. The Indian phones will have Wi-Fi tethering capabilities unlike the versions available in the US.